Since China entered the post-Mao "Reform Era" in the late 1970s and early 1980s, the Chinese economy has taken off as few economies ever have. Labor migration, rural enterprises, rising production, and globalization have all combined to end the isolation of the Chinese countryside. Yet although China's unsurpassed economic boom has produced reams of impressive statistics, has this economic growth led to improving the livelihood of the average Chinese person? Has development accompanied economic growth? Has the promise of "opening to the outside" been fulfilled in providing a better life for China's 1.2 billion-plus people? In this book, which is based on field work, Guldin presents and explores some of the changes sweeping through China in the 1990s that are affecting hundreds of millions of people. Guldin looks at the growth of town and village enterprises, labor mobility, and the other aspects of rural urbanization to investigate the connection between economic growth and development in contemporary China. The political changes at the village level, the swelling flows of capital, data, goods, and people, new ways of thinking and behaving, and a significant surge in social inequalities are all topis for chapter discussions. 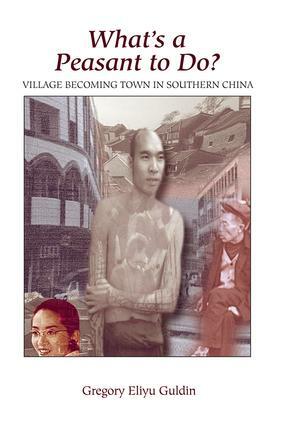 Guldin invites readers to face the same question that former Chinese peasants must face, namely, how to respond, as their villages are transformed forever. Conclusion: What Are Peasants to Do?